“There is nothing–absolutely nothing – half so much worth doing as simply messing about in boats.” – Kenneth Grahame, The Wind in the Willows | Vermont Paddle Pups! Especially if that boat is a new canoe! Today was the shakedown cruise for our new Swift Kipawa….it’s a little bittersweet to say farewell to Old Town, since those canoes got us started on this journey. But we had been looking (theoretically) at lightweight kevlar canoes….priced well beyond our Old Town Discovery and Camper canoes. We lucked out…Craig came through for us again; we bought our first 2 canoes from his “list”, and recently located a kevlar canoe in Concord NH on his list. A bit of a hike, but conveniently, I happened to have family business near there yesterday, so off I went, spec sheets and measurements in hand. The folks at Quickwater Canoe and Kayak could not have been more helpful; they even understood my taking measurements to be sure the dogs would fit! So today, we had to get out to give it a try…. Weather forecast was iffy; super-dooper doppler radar indicated we would not have rain until at least 0900, so we were in the water by 0700. We had a carry of 1/3 mile to the put-in. The canoe is definitely easier to carry, but next time we will use our homemade dolly. If we do have a long carry, we’ll also put foam padding on the carry handles. But as far as car-topping it…our shoulders cheered in jubilation, as the 42 lb. boat flew up on the roof with much more grace than our 85 lb. canoe ever exhibited! The walk-in was highlighted by our encounter with Bella, an 8-week old black lab puppy….cuteness to the max… Our guys were a bit confounded by this little baby running around them! The water was calm, we were alone on the water. The dogs hopped right in, just happy to ride in the canoe boat. The compartment configuration is a bit different, but the pups adjusted well. We knew that the initial stability for this shallow vee hull would be different from the Old Town; however, once we got moving, it was smoooooth paddling. The overall load capacity is a bit less than the Old Town, but we pack pretty light when canoe camping, and there is plenty of room for our gear in this boat. We saw flocks of ducks taking off, a beaver swimming and diving near his lodge, and a solitary loon. On one shore, a majestic, very large heron stood at attention….didn’t matter to him that he was being watched with 2 pairs of K9 laser eyes. 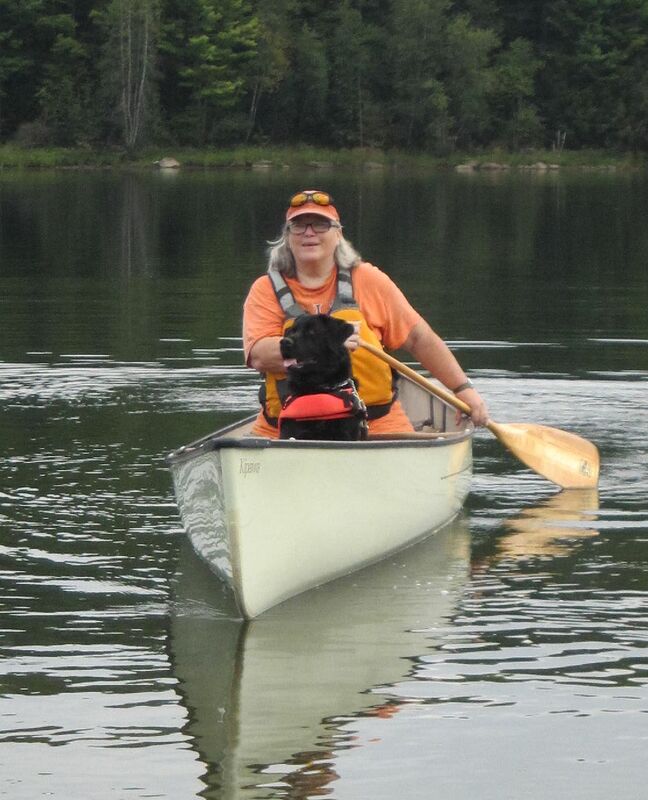 This canoe has a kneeling thwart; to check it out, each dog got a chance to be a solo pup….that was fun! I think soloing in this boat will be much more efficient than in the old boat. 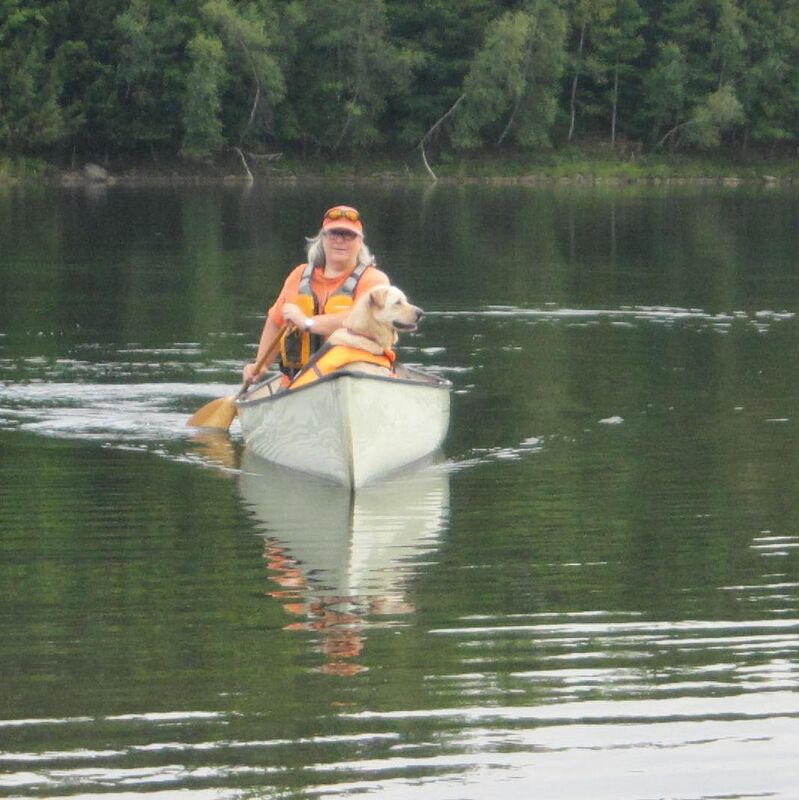 If dad and Edgar use our Kayak, then Griff and I can solo in the Swift…lots of fun to be had. ← A Tooney of Loons…. Wow, 42lbs compared to 85lbs, that sounds amazing! Getting my parent’s Old Town on top of the van when we canoe is such a pain – maybe if they need a replacement I would know what to suggest. 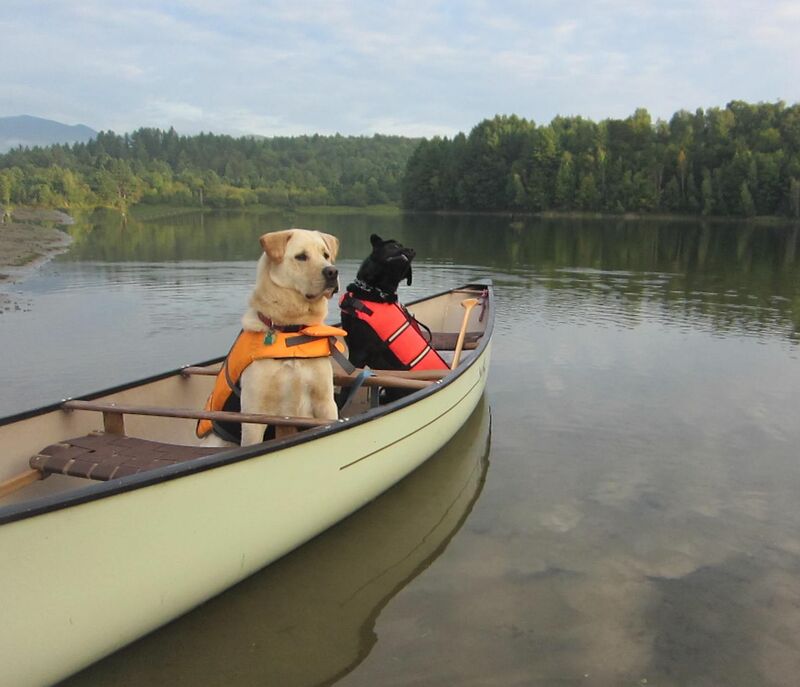 & I love the pictures of your dogs leading the way in the new canoe, really cute.